New York State is truly The Big Apple for a reason. It is the second largest apple producing state in the United States. 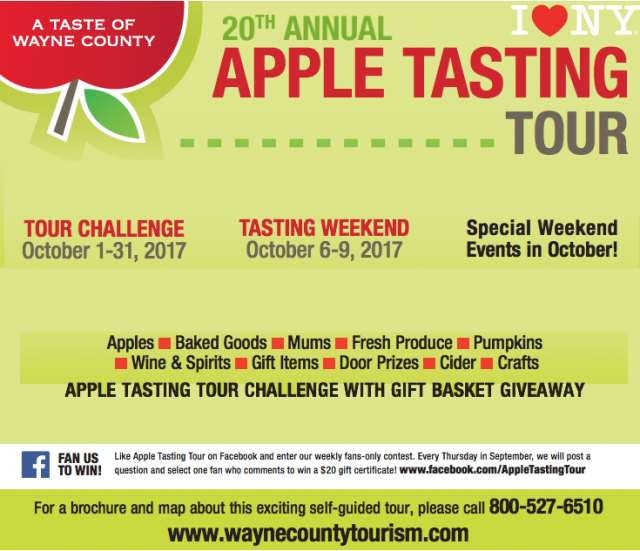 Wayne County NY, located on the southern shore of Lake Ontario, is the number one apple producing county in New York State. Travel our scenic country roads, ablaze in autumn glory from market to market. Take this opportunity to explore the essence of the apple. Each stop is unique, as is the taste and texture of apples. Discover the flavors, colors, and sizes…apples are as individual as we are! Everyone can be an expert! Apple taste testing is one way to learn the differences in apples including taste, texture and scent. Drive yourself from market to market and taste the different varieties and take the “Apple Taste Test”. Enjoy apples, baked goods, cider, fresh produce, door prize drawings and more! Tour Feature: Tasting Weekend is October 6 – 9, 2017. Each stop is unique during this special weekend. Apple tastings, food samples, door prizes, great events and lots of fun!